A young black man, Mike Brown, is dead at the hands of a police officer, his back riddled with bullets. A community is full of anger and outrage. And instead of working respectfully with the community, the Ferguson police department is making every possible decision to escalate the trauma in the community and put more people’s lives at risk. I’m an organizer. This means I've planned and been a part of small and large protests all over the country. I've never observed anything like the consistent failing of a police department handling non-violent protest and community anger. Shooting and killing an unarmed young black man, Mike Brown. No explanation needed. Dressing up in Riot Gear. You don’t wear your party shoes if you don’t want to dance. When the police dress up in their riot gear and plastic shields, they are sending the message that they are ready to fight the crowd. They are saying that they are protected and that they are willing to inflict harm on the demonstrators. This causes the demonstrators to up their anger level and it creates a cycle of escalation. It’s also is a slap in the face to the first amendment. Pointing Assault Weapons and Batons at Protesters: Guns/Batons are scary and lead to people dying. When police carry rifles to a protest, it tells the demonstrators that they are ready to kill you. Guns put peaceful protesters on edge and they cause people to overreact— chanting can become shouting, and marching can become running. Bringing in Military Vehicles: Again, the heavier the tools, the worse the response from a crowd out of fear and anger. An angry crowd in the US should never be treated like a war zone. Tear Gas: Tear gas should rarely, if at all be used on a crowd. First of all, folks with asthma can die from tear gas and since Ferguson is a poorer community, there is likely to be high asthma rates. Folks can also die or be critically injured if they are hit with a tear gas canister. The police made a decision to escalate the situation in Ferguson and every tear gas canister they deploy is another escalation. Telling Journalists to Go Home: The first amendment isn't pick and choose. Journalists have a right to observe and really an obligation to report. Again, banning journalists escalates a situation. ARRESTING JOURNALISTS: Again, no explanation needed. You don’t arrest journalists. Telling the Community not to Protest at Night: The first amendment doesn't end at sundown. Arresting STL Alderman Antonio French: Yep, they arrested a local official who’s been the on the ground reporter. Because they really don’t want to keep escalating the situation. 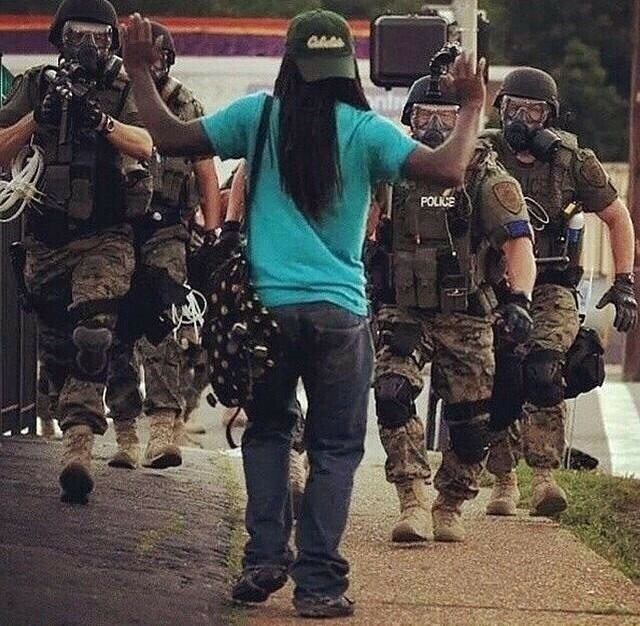 SO WHAT SHOULD HAVE THE FERGUSON POLICE DONE? They should have gathered people of faith and trauma specialists to listen to the community. They should have ordered pizzas and sodas to feed people into night as they aired their anger and grievances. They should have packed away all need to fight the community. They should have committed to an open and transparent process for justice. They should have not relied on creating the conditions for a riot to cover up for their history of problematic policing. Yes, it was wrong for people to commit property damage but I am one-hundred percent confident that non-violent, non-aggressive policing would have prevented the outburst of rage. It’s not too late for the Ferguson to stop failing. But in the meantime, the DOJ should send human rights observers to Ferguson and relive the current police of their duties until the community regains trust and calm. Not one more death in Ferguson, or anywhere, from the police. Updated: The police are still making dangerous choices. Reach out to your Member of Congress and demand that the DOJ take over handling interacting with protesters. I’m an organizer by calling.